Moving Day® Silicon Valley is the National Parkinson Foundation’s annual fundraising walk/run event taking place at the Guadalupe River Park, in a section known as Arena Green East. It is a fun and inspiring fundraising event that unites families, friends and communities both large and small in the fight against Parkinson’s disease. This celebration of movement will feature a family friendly walk course, a kids area, a chance to meet Bay Area Parkinson’s researchers and a special Movement Pavilion featuring yoga, dance, Tai Chi, Pilates, etc. all proven to help manage the symptoms of PD. Here are some helpful FAQs to help you plan the day. Where is the Moving Day Silicon Valley walk? 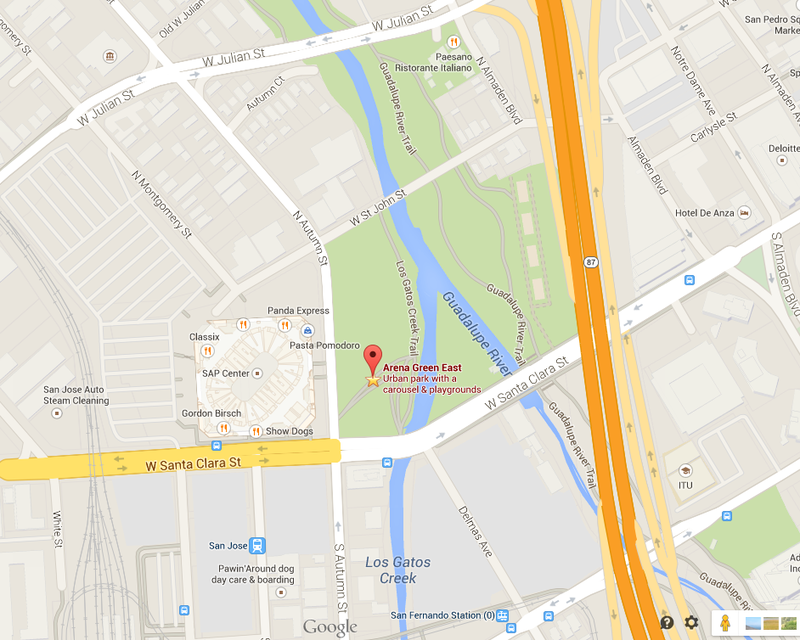 Arena Green is at N Autumn Street and W St John Street in San Jose, at Guadalupe Park, right near SAP Center. When does the event begin? Registration starts at 9am. When does the event end? The event goes until 12:30. What are the directions? Choose your preferred highway below for directions…. Southbound 280 Exit at Bird Avenue. Turn left onto Bird Avenue and continue as it becomes Autumn Street. Northbound 280 Exit onto Route 87 (Guadalupe Pkwy) northbound. Exit either at Santa Clara Street or Julian Street. Follow the signs directing you to available parking. Northbound Route 87 Exit either at Santa Clara Street or Julian Street. Follow the signs directing you to available parking. Southbound 101 Exit onto Route 87 (Guadalupe Pkwy) then exit at Julian Street. Follow the signs directing you to available parking. Northbound 101 Exit onto Interstate 280 northbound. Then exit onto Route 87 (Guadalupe Pkwy) northbound. Exit either at Santa Clara Street or Julian Street. Follow the signs directing you to available parking. Southbound 680 Southbound 680 becomes Interstate 280 northbound. Then exit onto Route 87 (Guadalupe Pkwy) northbound. Exit either Santa Clara Street or Julian Street. Follow the signs directing you to available parking. Southbound 880 Exit at Coleman Avenue. Turn left onto Coleman Avenue (crossing over the freeway). Proceed on Coleman Avenue to Julian Street or Market Street. Follow the signs directing you to available parking. Northbound 17 Exit onto Interstate 280 southbound and exit at Bird Avenue. Turn left onto Bird Avenue and continue as it becomes Autumn Street. Follow the signs directing you to available parking. Once we park, where do we go? Walk to N Autumn and W St. John Street, near the Guadalupe River trail (see map). 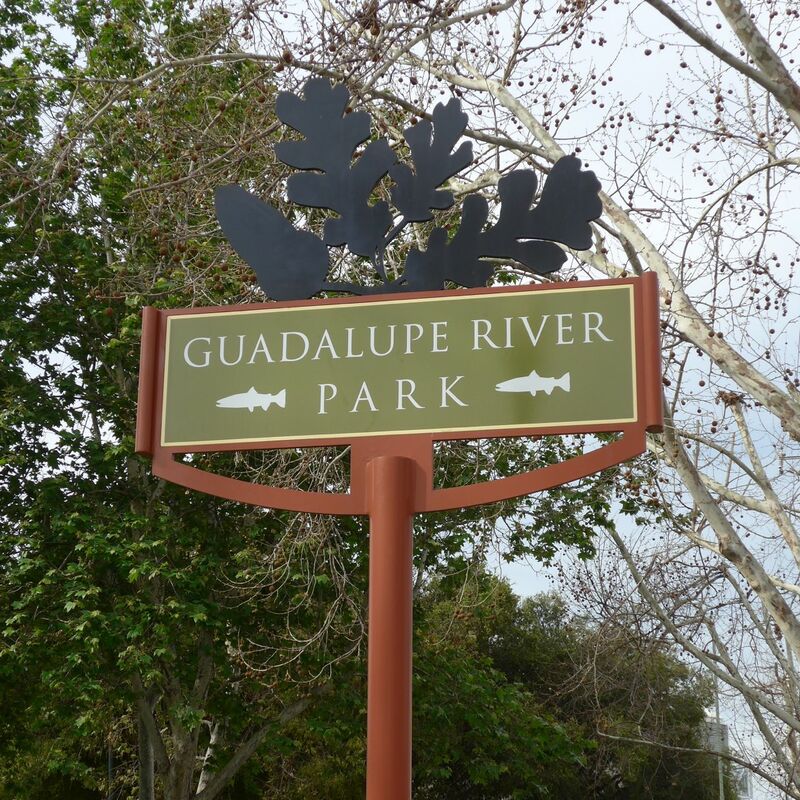 Walk a couple of blocks along the Guadalupe River trail, passing the team tailgate area and look for the Registration Table ahead. Register if you haven’t already, and get your coupon for a Moving Day t-shirt if you have donated $100 or more. Turn the loop and notice the Movement Pavilion (a cluster of tents offering exercises of all kinds. )Further along the loop, you’ll see the Resource Pavilion with information on everything to do with PD. Beyond the Resource Pavilion, you’ll come upon a Stage and the Start and Finish of the Walks. 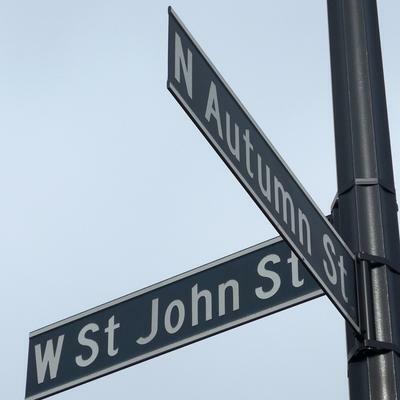 Once it is time to walk, you’ll cross W. St. John Street to start the marked 1, 2, and 3-mile routes. Don’t start walking until after the opening ceremony at the stage (it starts at 10am), where there will be Zumba and a few balance exercises to get you moving. Finally, save your clapping hands for a huge round of applause for the researchers and PD professionals who will be named Parkinson Pioneers in honor of their dedication to Parkinson’s Disease. That is all on the stage, next to the start line, just before the walk starts at 10:30am. How long is the walk? You have a choice of walking 1, 2, or 3 mile routes. If you are not comfortable walking, there will be classes in the Pavilions that continue during the walk time so you can keep MOVING! How many walking teams will participate? 28 and growing! There’s always room for you! What do we wear? Come prepared to walk and move! Is there food? There are two food trucks scheduled to appear: Waffleamore and Barefoot Coffee Roasters. NPF will also have fruit and light continental breakfast items available throughout the day. There will not be individual water bottles so remember to bring your reusable ones with you and they will fill them up. We are trying to be environmentally friendly! What if one of my guests needs to be dropped off? There is no stopping on Santa Clara Street in front of the SAP Center at San Jose. Passenger drop-off and pick-up zones are located on Autumn Street and on W. St. John near the start and finish line. W. St John will be closed to through traffic, but drop-offs will be allowed through. Disabled guests may be most conveniently dropped off and picked up at the North Entrance curb. What can I do before the walk? • Pick up your Moving Day t-shirt if you qualify for one. • Join in for a couple of classes in the tents at 9:30 or at 9:45am. • Browse at the Resource Pavilion. • Walk near the stage where Parkinson’s Pioneers will assemble (the area will be signed) and give them some praise. They’re here for you! 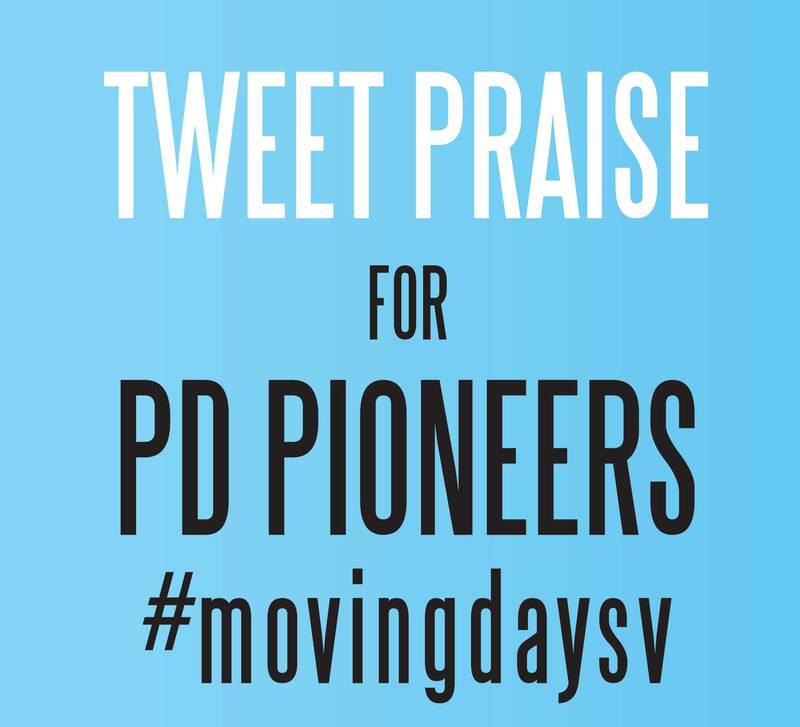 • Take photos with your cell and tweet them to #movingdaysv. Send your praise for Pioneers there too. We’ll make sure they get a copy of it. What about after the walk? • Stick around for the closing ceremony. • Take another couple of classes in the Movement Pavilion. • Make some new friends! Are there toilets? Yes, near registration, and the start/finish line. Questions may be sent to Colleen Fischer, Moving Day® Bay Area Coordinator, National Parkinson Foundation at 925-421-6737 cfischer@parkinson.org. Register for the event at www.movingdaysiliconvalley.org. For more information about the National Parkinson Foundation, please visit http://www.parkinson.org or call 1-800-4PD-INFO (473-4636).